Russia, Iran and Turkey have reached an agreement on a mechanism to monitor the truce in Syria at the talks in Astana, a source in the Iranian delegation informed TASS on Jan. 24. "Iran, Russia and Turkey have agreed on the mechanism to monitor the ceasefire in Syria," the source said. "The parties continue to discuss the communique." Securing and consolidating the ceasefire in Syria is the main objective of the talks in Kazakhstan’s capital, which involve representatives of the Syrian government and the opposition, Russia, Iran, Turkey and UN Secretary-General’s Special Envoy, Staffan de Mistura. U.S. Ambassador to Kazahstan, George Krol, has been invited to the talks as an observer. 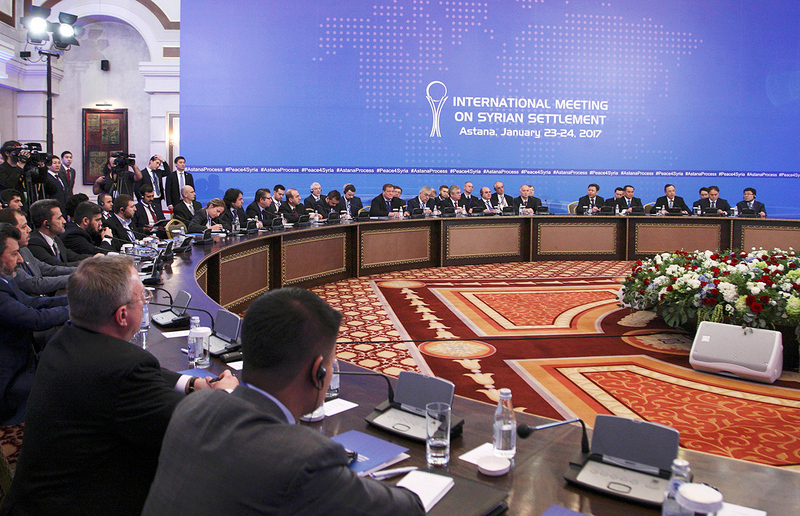 The plans of the guarantor states - Russia, Turkey and Iran - to set up a trilateral mechanism to monitor compliance with the ceasefire in Syria are part of the draft final communique on Astana talks. "We are planning to create a trilateral mechanism to make sure the ceasefire be observed and to prevent any provocations," says the document obtained by TASS on Jan. 24.